Denny Hamlin, driver of the #11 FedEx Express Toyota, and Martin Truex Jr., driver of the #78 Bass Pro Shops/Tracker Boats Toyota, lead the field past the green flag to start the Monster Energy NASCAR Cup Series Championship Ford EcoBoost 400 at Homestead-Miami Speedway on November 19, 2017 in Homestead, Florida. Photo by Sarah Crabill/Getty Images. 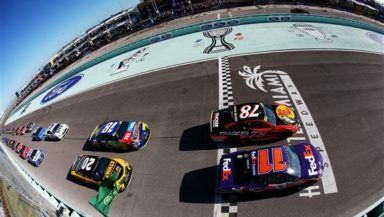 The Monster Energy NASCAR Cup Series, NASCAR Xfinity Series and Camping World Truck Series will all be winding up at Homestead-Miami with the Championship 4 races in each series. Check out the full schedule for Ford Championship weekend below, which is subject to change.